Home / Cincinnati Reds / The last great Jay Bruce in a Reds Uniform Memory? The Reds season is a mess, and they’re going to blow this thing up. But on this Sunday, Johnny Cueto and Jay Bruce turned back the clock. Cueto threw seven shutout innings and struck out nine for his fourth victory of the year. It kind of stinks because days like today are just auditions for a contender. And we can’t begin to figure out Jay Bruce, we’re absolutely done trying. We cut him from one of our most important fantasy teams late last night. It figures that he would have a day like he did today. There’s probably no salvaging things for Bruce long-term in a Reds uniform at this point. He either plays poorly and he’s a goner, or he plays well and the Reds move him shortly after the All-Star game. You look at the calender, and it’s June 7th. 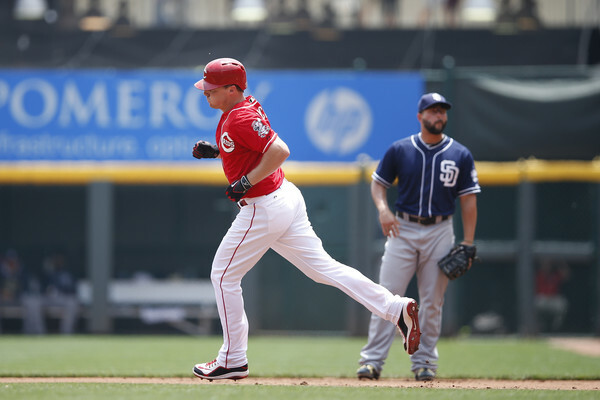 It’s possible that Jay Bruce could just have over a month left in a Reds uniform, and it’s kind of a sad realization to accept that he’s never going to become a franchise cornerstone. That said, the guy is still making memories. He drove in all four Reds runs today with a towering solo homer to get them on the board, and a three run blast later in the game to cement the win. He’s up to nine home runs on the year. There will come a day that we’ll have to eulogize Bruce as a Red on this blog. But today is not that day. We just wish the Reds were playing meaningful baseball games at this point. But they’re stuck in the mud as we suspected. Today was just a three hour lapse in what is sure to be a season of pain.